Is there a better way to spend a Tuesday afternoon….I think not. Thank you to all those who came out yesterday (3.29.2016) to Madonna Mtn. 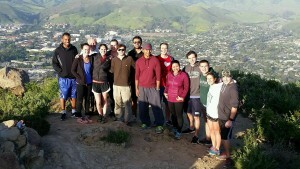 (aka Cerro San Luis Obispo) for a super fun hike. Cal Poly Rotaract joined in as well as some new faces came along for the hike up the mountain. Apparently. Jim Eaton of Rotary de Tolosa beat us to the top and was found waiting for us Rotaractors.